Cockneys vs Zombies Blu-ray Review Some poor direction and a soundtrack that seems desperate to appeal to a mainstream audience results in Cockneys vs. Zombies feeling more like an unintentional B-movie than the cult gem that it could have been. You’re a lot better off watching Shaun of the Dead, and this movie does a good job of reminding you how superior the other options are. Cockneys vs. Zombies has a title that carries a lot of promise and potential, but it’s a shame that it doesn’t take advantage of it. Borrowing heavily from films before it such as the flawless Shaun of the Dead and the respectable Doghouse, this latest entry into the ‘zomedy’ genre is unoriginal, unfunny and completely unnecessary. 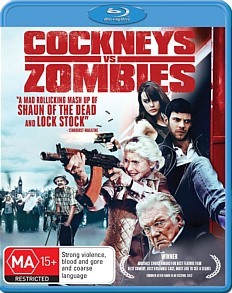 What you see is what you get with Cockneys vs. Zombies, which is a group of East London geezers doing their best to survive a sudden outbreak of the undead. The film follows the events of a group of young adults who were in the process of robbing a bank when London was hit by the plague, and are now on their way to save a group of elderly people from the local retirement village from the zombies. What could be funnier than a group of geriatrics wielding assault rifles and shotguns while swearing constantly? Nothing, according to Cockneys vs. Zombies. While it is humorous the first couple of times the film gets carried away and it becomes rather annoying making the film a lot more immature than it should be. None of the characters are engaging or interesting and the film wasted a huge opportunity to create some ridiculous and memorable cockney characters. The visuals are nothing to get excited over either, with poor digital post production that is instantly noticeable. Some poor direction and a soundtrack that seems desperate to appeal to a mainstream audience results in Cockneys vs. Zombies feeling more like an unintentional B-movie than the cult gem that it could have been. You’re a lot better off watching Shaun of the Dead, and this movie does a good job of reminding you how superior the other options are.